Happy Winter Solstice! Fortunately, there aren’t too many icicles around here at the moment, but that’ll change. Tomorrow’s daylight will be a little longer and before we know it, we’ll be on the water again. That’s what I keep telling myself. Meanwhile, as the hustle of the holidays keep me from thinking too hard on matters of wind and water, I know that as soon as the New Year arrives The Commodores Reception will shift my focus back where it belongs — on Boat Life (or life with a boat). Commodore Gary Reimer will be hosting the reception at his house on Sunday, January 5 from 4:00 to 7:00 pm. If the weather is cooperative, there will be a fire — Sounds good! Check out the event on facebook for further details. 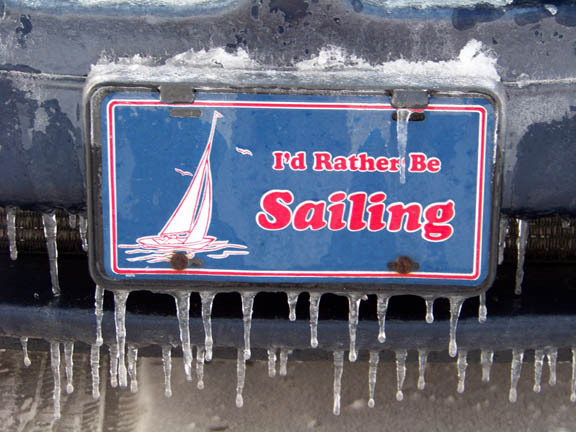 Make 2014 the year you remember for sailing! This entry was posted in Club News by poycinfo. Bookmark the permalink.